Something rather remarkable happened in my dance last night. I danced a tanda with one of my favorite local partners at a level that I didn’t think was possible for me. It’s as if something become magically unlocked in my body and released in my dance — apparently because I finally was able to empty my head, listen to my body and let the artist in. It’s not that I haven’t been told that many times before and have been working on it for years. But in the past, each time I’ve felt that I’d arrived, it ended step being nothing more than a baby step and I realized (in my mind) that I had a long ways to go. So while my mind is useful from time to time helping me understand what’s going on in my dance, it’s only when I let it go that I seem to move forward to places I’ve never been. I do watch videos from time to time. Other dancers inspire me — Carlitos Espinoza is one of my favorites — I have come to realize that it’s not by looking out at others, but by looking in at myself (or should I say not looking in) — giving myself permission to just be and listen to my body — that good things happen. As with many things tango, what is most remarkable to me is that when I let it go and don’t focus on it, it happens — whatever “it” is. But when I focus on “it” nothing happens. Don’t misunderstand what I’m trying to say. I’m not saying that focusing on elements of technique doesn’t help. Some of you may have read about a discovery I recently had by understanding the principles of barefoot running and applying that to tango. I’m now able to carry my core properly and step lightly with spring in my feet in important ways that have improved my dance. And applying the same principles improved my snow skiing last winter and my bicycling this spring — go figure! When I started studying with Susana Miller a few years ago, I recall her telling that she will be helping me improve my dance by taking things out of my body and not by putting more things in. She said that I already had enough in my body — or should I say too much — too many things in my body that were getting in the way. And while I wasn’t always sure what was happening, I let it go and trusted her to get me back on the right path. I took classes with Susana in April of this year, and then again six weeks later this June which provided me two opportunities to move forward. And just when she told me to quit thinking and to quit focusing on steps, the steps happened. It wasn’t easy for me to do or should I say ‘let happen’ … comments like “quiet the mind”, “lose your thoughts”, “walk with an innocent (idiot) look” and “let your body speak to you” seems so simple to me, but it’s not easy. But for the moment, it is working for me in good ways. The world has lost one of the great visionaries in history and the Thomas Edison of our times. Yet he continues on as in inspiration to all of us that seek innovation, perfection and success. As Slate’s Farhad Manjoo writes about Jobs following his death, so too, does he characterize tango so eloquently, “The major touchstones of the Jobs aesthetic are obvious — … he believed in elegance and minimalism.” Steve, we will miss you … and we will tango on. Some tango definitions, tango códigos & tango floor craft for beginners. This post is long overdue and my massive apologies to my faithful readers. Here it is – a post bringing closure (for now) to my discussion of códigos and floorcraft. And while I still believe that the Códigos from Cachirulo that I talked about earlier on these pages, are all that is needed for experienced dancers — and yes, they remain prominently posted in multiple languages at Cachirulo’s new location at Villa Malcolm — these same códigos don’t necessarily work for beginners. They leave too much open to personal interpretation. So to compliment the simple, but effective list I already shared here, I’ve developed a separate list for beginners and the uninitiated who should be able to comfortably dance tango at any milonga simply by paying attention to the following. No list is ever perfect, but at least this is a good place to start. Milonga – A word used to describe two different things: (1) a tango social dance event in general, and (2) a specific style of tango music that is a lively, syncopated eight-beat rhythm (an ‘excited’ habanera). At a Milonga (tango social dance), music is usually played in tandas or sets of three or four songs. Dancers typically stay with the same partner until the tanda is finished. On the other hand, the milonga style of music is usually played along with the other two principal styles of traditional tango music — tango and vals. Tanda – A set of tango songs — usually three or four songs — of a particular style and usually from the same orchestra and the same period, lasting 10-12 minutes. At milongas, couples typically dance a complete tanda together, before returning to their tables to prepare for the next set of songs (tanda). Cortina – A break song or transition song of an entirely different musical style lasting at least 30 seconds that signals to the dancers that the tanda is over and the next tanda will begin shortly. During cortinas, couples thank each other for the dance and return to their seats so they can prepare for the next dance. Cortinas can also be viewed as “palette cleansers” to help dancers transition their bodies from one style of music to another. 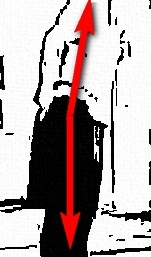 Códigos – Tango ‘codes of ethics’ or floorcraft guidelines for a milonga. These guidelines govern people’s behavior throughout the evening at a milonga — entering, being seated, chosing a partner, dancing, watching others dance, and leaving the dance. Respecting the tango códigos provides some discipline on the dance floor, and allows everyone to more fully enjoy their time at the milonga. Typically, the man asks the women to dance, instead of the woman asking the man. After two people agree to dance, the man should approach the women while she remains seated. The man stops near the edge of the dance floor closest to where she is sitting, the woman stands up, approaches her partner, and they prepare to dance. If the floor is crowded, the lead should make eye contact with the lead approaching his spot on the dance floor, before he enters the floor, so the couple can join the line of dance with minimal disruption. More experienced couples dance around the edge of the dance floor. Less skilled dancers dance in the middle. When dancing, don’t confuse the social dance floor with a stage (details below). At the end of a tanda, the man accompanies the women to her seat, before chatting with others or returning to his seat. All milongas have a line of dance, where couples slowly circulate around the outside of the dance floor in a counter-clockwise direction. Everyone should stay in their lane and maintain their same position in the line of dance where they started the dance, until the end of a tanda. No zig-zagging in and out of the line of dance. Avoid passing the couple in front of you. Never pass a couple on their right side. If a couple stops in front of you or is moving slower than you’d like, dance in place with your partner until the other couples starts moving again. Leads should not teach at a milonga, follows should not ask for tips and no one should ask for suggestions from their partner. Milongas are social events for enjoyment and pleasure, while practicas, workshops and classes are places to learn how to dance and for tips or questions. Milongas are not places to call attention to what others are doing wrong. During a dance, particularly on a crowded dance floor, keep your feet on the floor. No boleos on a busy floor. 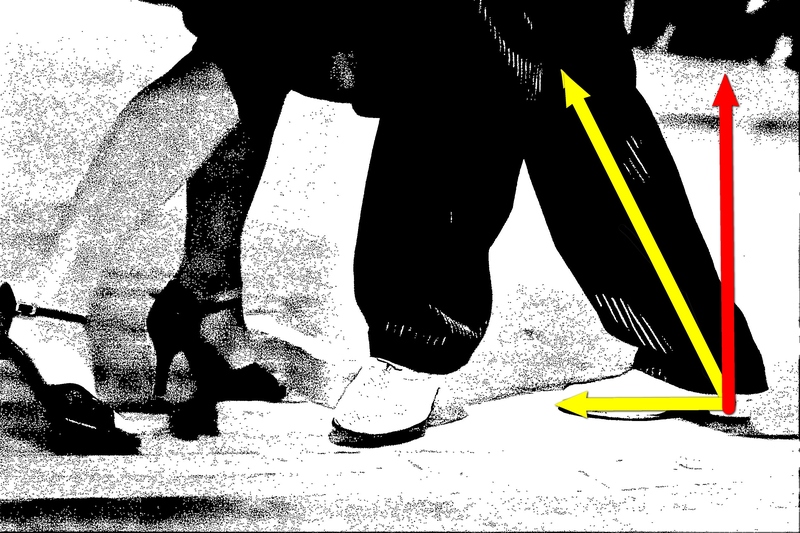 That helps avoid injuries to other dancers with a mis-directed spiked heel. Respect the space of others in front of you and others behind you in the line of dance. There is a small amount of space around you – perhaps a 2’ to 3’ circle – that belongs to you, while the rest of the space is shared space and access is negotiated in the moment with other dancers around you. It is up to you to understand the difference. Don’t disrupt the dance of others. Your responsibility is to keep circulating without bothering other dancers on the dance floor. If you want to stop talk or work on something, either leave the dance floor or go to the middle. Practica – A guided tango practice session where dancers can work on new steps and where they can iron out problems with their dance. Music is usually played continuously during a Practica and someone is usually available to assist dancers, as needed. Milongas, which are more structured, should not be confused with Practicas.